Be it your Identification Card, passport, flight ticket, or other vital papers; do not ever forget to take photo copies of them with you prior to leaving your hotel room. If any of them is lost or stolen, you can use these duplicates to solve the issue temporarily. Even though it sounds overwhelming, it is crucial. You should have a list of all your valuables that you have packed with you. It is also recommended that you take photographs of each of them for future correspondence. In case of any mishaps, you can provide this list to your insurance company for accurate information. At first, gather information about the location of the hotel and then book accordingly. If you find that your chosen hotel is located in a high risk region, skip it without any hesitation. However, if you end up making reservation at an unsafe hotel, be extra cautious and keep all your valuables with you always. If you need to spend night in unknown hotels, make sure that they have electronic locks for each and every guest room. These are modern door locks with peepholes and dead bolts, which provide utmost safety and security by generating new lock combinations for all guests mechanically. Hence, no intruder can enter by using a duplicate key. Take your time to double-check the hotel or more precisely the room you have booked. Ensure that the telephone is working properly. The door and window locks should also be in good condition. There must be smoke detector and efficient fire extinguishing system in your room. Do not forget to ask about emergency exits prior to staying in a hotel overnight. 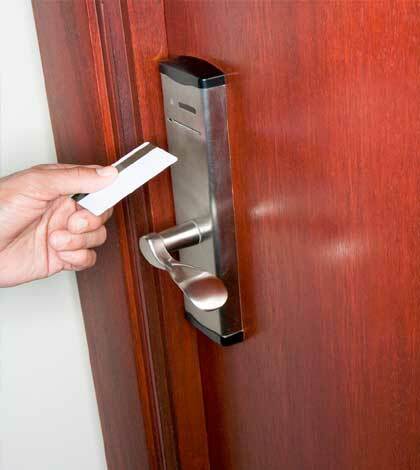 If you ever find that you have lost your hotel room key, draw the attention of the hotel authority to this matter. It is their responsibility to replace the key or shift you to another room. Never stay in a guest room which does not have original key. There are many luxurious hotels that do not offer in-room safes. However, you should always choose one, which has its rooms equipped with safes so that you do not need to take your precious belongings along with you each time you go out of the hotel. You can also keep a diversion safe with you for stashing your valuable items in a secure manner. You should always lock your laptop up with a laptop security cable before leaving the hotel room. Many people also fasten the device with any fixed item present within the room for making it immovable. Nonetheless, you should keep a backup of all your important digital documents while traveling to a hotel. If you are driving yourself to the hotel, remove all your expensive car items before checking-in. You might be provided a valet ticket for parking your car in the parking lot of the hotel. In such case, make sure that the number of your room is not mentioned on the ticket. If you need to use the parking garage of the hotel at night, ask for valet service. You should always park your car in such an area which is lighted enough. Parking in close proximity of the hotel exit is also good for your safety and security.